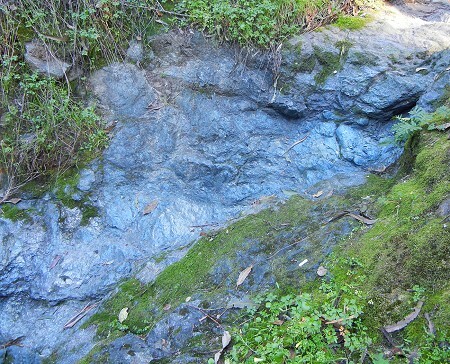 Longtime commenter artisancrafts reminded me, in a comment to my last post, that there’s a nice exposure of blueschist at the north edge of Mills College. Yesterday I easily located it by following his/her directions. First there’s the old railbed that once ran to Laundry Canyon. This stretch of it, which once continued down through the Fan parallel to High Street, used to be part of Courtland Street. At the spot in the distance where the sun shines across the roadbed is this lovely exposure, about 2 by 3 meters. It’s clearly worn by water, and a little concrete-lined ditch running along the uphill side of the roadbed feeds it. Following it upstream takes you right up to the 580 freeway abutment, where it veers north in a culvert. The stream is a mystery that I won’t try to solve today. Back to the rock. Getting closer to it, you may not believe your camera. Clear blue skylight can do that. This closeup, showing tightly folded lamination in the cleft on the right edge of the first shot, is a truer indication of its color thanks to my camera’s flash. 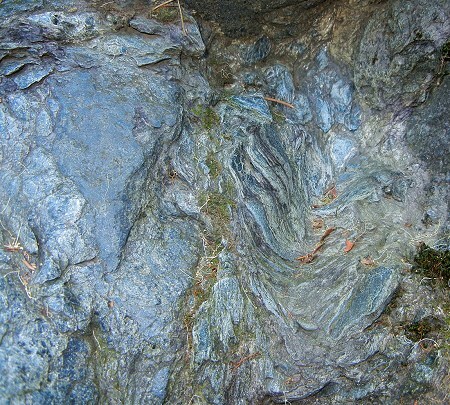 It’s classic blueschist, the largest outcrop of it I’ve seen in Oakland. Let’s call it blueschist-grade melange, what’s usually referred to in Franciscan circles as a high-grade block, and I’m very pleased to know that we have one in town. This entry was posted on 14 January 2015 at 2:16 pm and is filed under Oakland blueschist, Oakland geology puzzles, Oakland streams and water. You can follow any responses to this entry through the RSS 2.0 feed. You can skip to the end and leave a response. Pinging is currently not allowed. I’m so glad you could check it out. It’s really pretty, hands down my favorite. I wonder how it polishes. It must have taken a very long time for the stream to wear it down like that. Did you see the nearby survey marker? Also, how is blueschist formed? I’ve read about it, but like when I’m reading John McPhee, I am having trouble understanding it all. Thanks! We did see the marker. 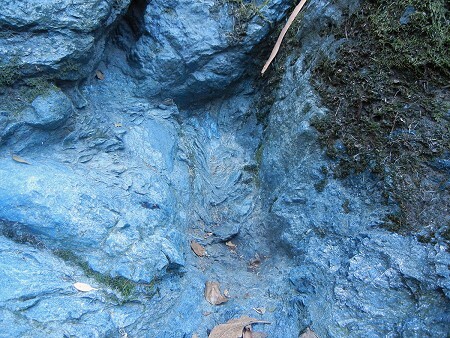 Blueschist is made of a set of minerals that form at high pressure, but low temperature. You get those conditions in a piece of rock that is pulled down in a subduction zone (high pressure) but only briefly, so it doesn’t fully heat up to form, say, gneiss. Why we find small bodies of blueschist inside large bodies of subduction-related rocks isn’t well understand, but it’s an important clue, like finding a mitten inside a bank of plowed-up snow along a roadside. I was intrigued by this when you posted it and just got around to checking it out. Very nice indeed! I wouldn’t think of swinging a rock hammer on the Mills campus, but I brought back a few water worn bits from the streambed to look at under the microscope. One is the blueschist itself, with distinct glaucophane crystals. Another is massive talc; soapstone. Another is a talc schist, with platy talc crystals mixed with crystals of a hard green mineral (actinolite?) and mica. The big question is what is this outcrop doing there?? Seems too big to be part of the alluvium. I guess so close to the fault, you might find anything. Yes, what is it doing there? Until I find more examples – and maybe not even then – I wouldn’t be sure. My best guess is that it’s a high-grade block in the Franciscan. It looks very much like the classic stuff at Ward Creek in Cazadero. 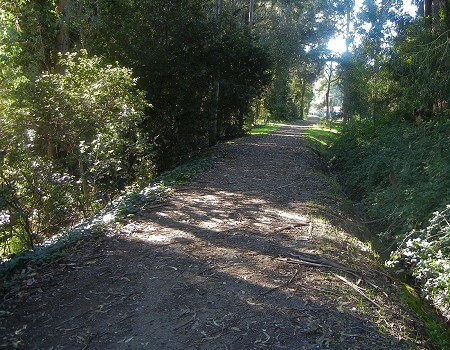 The only other examples I know of so far in Oakland are (1) the boulders around the overlook at Joaquin Miller Park and (2) a rounded boulder I found in the streambed of Rettig canyon. I know El Cerrito is not your beat, but a friend bought a house there last year and it is built on a large and beautiful blueshist outcrop. I told him I liked the rock even more than the house. This is near the Mira Vista Golf Course, about half mile west of the fault.